I have been playing in the sunshine. Finally beautiful weather with no coat on and my piggies in the flipflops. I can breathe again. No turning back now. 1. I have been watching a robin’s nest the past few weeks. Each spring a nest is built on this wreath I have on my side door. The kids love to watch the babies grow. They are peeking out and mom is way too busy feeding them. Is it ok to jump yet? And today I startled them by snapping a picture and off they flew. Made my day to see that happen. 2. 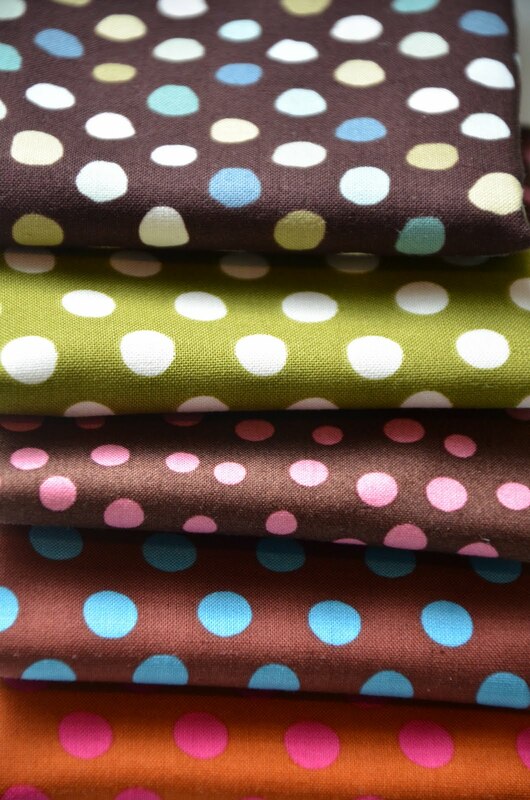 Loving polka dots. I see these clamped and discharged-itajame with circles. 3. Persevering with machine quilting a small piece. Until I put the binding on wrong last night when it was way too late to be sewing. I hope to finish it tonight. 4. Getting excited to go next week and just itching to start dyeing. I did a little pole wrapping and dyeing on this silk scarf. Not exactly what I wanted but still turned out well enough to wear it. I still can’t get consistent dye take up with the silk and will try a larger diameter pole later. 5. Getting excited for my class next week. Leave on Sunday and am accumulating my supplies. 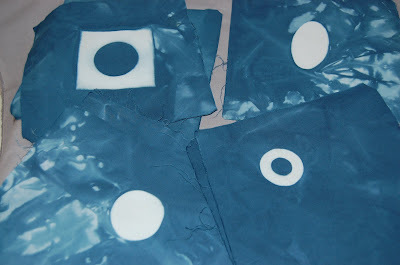 This entry was posted in itajime shibori on May 11, 2011 by Colleen Kole. Plenty of things going on. Nice to look back and see all the places I have been this week. And the fun I am having. 1. Shibori Class with Glennis. Silk -I loved the feel of it. I loved how easily and quickly it took the dye. Which has no to low odor and leaves no stains on your hands. Dyeing silk on the first day. I can only dream of what is to come. Loved it. Note to self: buy or find some better clamps to get crisp edges on the shapes. Use smaller pieces of silk to try these experiments. 2. Working on filling in all those color charts. I never can waste any kind of paint. This is Setacolor paints from the Color theory class. Note to self: find out the right way to apply this to fabric. Just dilute with water? A medium? I have no idea. I was just using up what I had leftover for the lesson. 3. Just a little hand stitching. Facings. I am trying to enjoy the process and not get think too much with- what will I do with all this information and how will I use it? It’s on simmer right now. And that’s a good place to be. Have a good weekend, my friends! This entry was posted in fabric dyeing, itajime shibori, surface design, workshops on March 11, 2011 by Colleen Kole. I have been transported to the land of the lost. The land of dyeing silk. I may never return. I am very happy and relaxed here. They may call my name for meals and I may never come up for them. I don’t want to put any words to it yet. Except -happy. Lost in the land of silk dyeing. This entry was posted in fabric dyeing, itajime shibori, silk on March 10, 2011 by Colleen Kole. Never got around to snow dyeing on Wednesday. I came to my senses and realized I just had a little bit of time to see what would happen with those little plexiglass cut-outs. And the reason I hauled out the dye to begin with was that I needed some more navy blue for a background I am working on. But- there wasn’t much pfd fabric left in my stash. 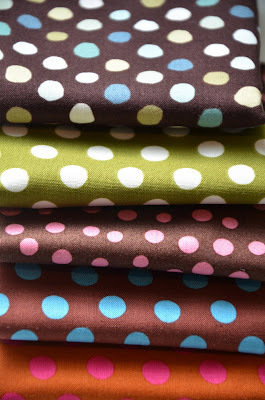 I tried a 50 percent cotton/ linen blend from Kaufman that I had. 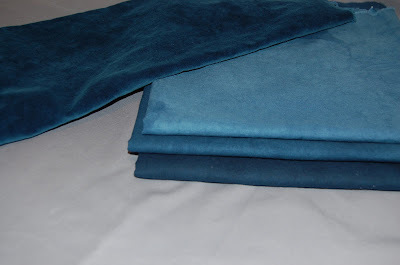 The piece on the left is a fat quarter of velvet. So pretty. The others aren’t quite dark enough for what I needed. 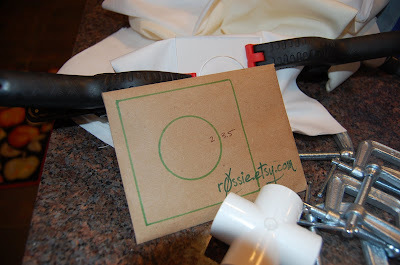 These are the pieces that I used c-clamps on with the plexiglass cut-outs. I only had a few c-clamps. Not enough to make a big batch but something I will definitely do this summer when I can make more of a mess. Then, I had tried wrapping a piece of plastic pipe. Of course, without reading about how to do this. Nice result on the one end. I just didn’t have the pipe placed in the right kind of container nor did I even come close to the true technique. Another technique to put on my list for summer. I added a little sunshine to the day in the form of one of my quilt tops from vacation and machine stitched away. Bright colors definitely help on a snowy day! I heavily quilted this one just to work on fine machine quilting. I now truly appreciate those machine quilters that do lots of fine line work-this is truly an art. It reminded me to schedule an eye doctor appointment. I love the fine lines! Now what else to do with them? 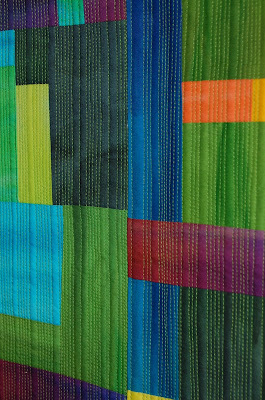 This entry was posted in fabric dyeing, itajime shibori, machine quilting on February 26, 2010 by Colleen Kole. 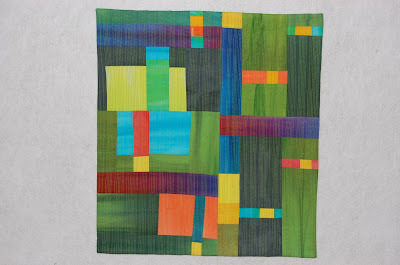 I always love quilters. They are so nice and always friendly. I met another art quilter and she came over to look at some of my notes to try to decide what class she would like to take in the future. She also asked to look at my finished quilts from last year. Always fun to have someone appreciate your work. Thanks Elizabeth for coming! But I have a confession. Ok I admit it. I have the winter blahs. Nothing in particular is exciting me. Maybe there is nothing exciting to do. And it’s snowing again. Other than meeting Elizabeth, I did little or nothing yesterday -or nothing exceptionally productive let’s say. Which is really not like me. So, in effort to jump over this boring place I am in-I am going to try something new today. I purchased these little plexiglass cut-outs from a wonderful seller Rossie and they arrived back when I was on vacation. She even included a great set of instructions with them. I am going to sandwich them between clamps and and pop them in some dye. 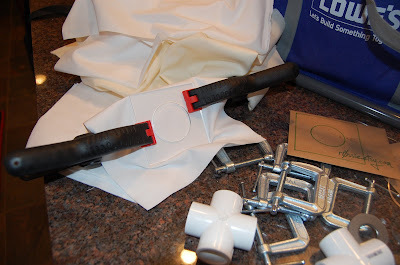 While I am at the process of using up a little bit of dye I have mixed up, I will try some other things too-clamping some washers and wrapping a plastic pole. And if I have any left, I will pop some more pieces in plastic bins for snow dyeing. If I can’t beat the snow blahs, maybe I should go play in it. I am investigating cold freeze dyeing with natural products.My husband just shook his head when he pulled out a big bag of frozen flower petals last night when he was digging for ice cream. But bless his heart, he didn’t even say -what next? 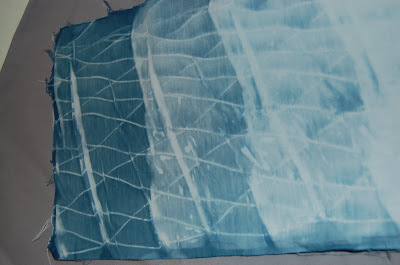 This entry was posted in itajime shibori, snow dyeing on February 24, 2010 by Colleen Kole.